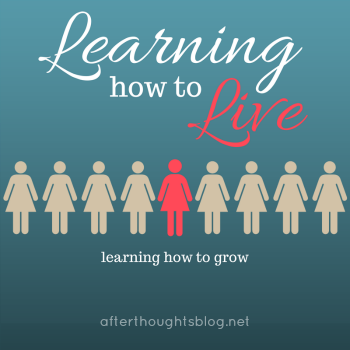 I had the honor and privilege of being a guest over at Afterthoughts yesterday as a part of Brandy’s amazing series on “Learning How to Live.” Growing and learning as persons ourselves needs to be an important aspect of our lives. Before we are wives or mothers or teachers, we are persons, created in God’s image and made to serve and love Him and grow in our reflection of Him. Even if your entire family and life work was taken from you, you would still be a person made to know and grow in Christ. We cannot neglect that essential, core part of our being. Gardening is my poetic knowledge education, where my thoughts and the real world collide. When I go out there and pull weeds, I am becoming a more whole person. My indoor, inner-thought self acknowledges that there is value in nature and in the tangible, so I push myself out of my hole and allow practices to order my loves and rearrange my heart. Of course, pulling weeds is also a way to mix my philosophical self with nature. As I actually see things like weeds growing up among crops, like vines clinging to their branches, like leaves unfurling to soak up the sun, I understand why Jesus used so many plant-based metaphors. More than that, I realize how much more a metaphor means when you see it, experience it, taste it, even if you thought you understood it well enough before. When April and May come, the garden is just beginning to sprout. It holds out so much hope and promise as peas begin climbing their strings, as lettuce sprouts fill the beds, and as the raspberries and strawberries wake up. 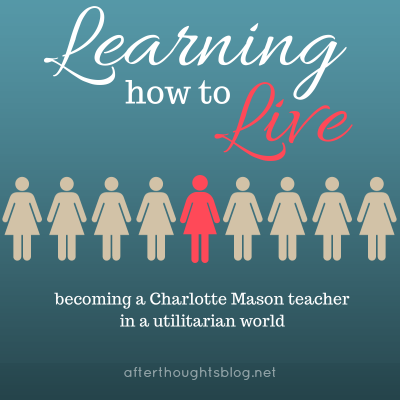 Inside, April and May usually hold unrest as we are all ready to be done with the homeschool year, as the house is in need of a spring cleaning for which there is no time. Inside, it can get tense. The tension used to build and build and I’d try to find ways to deny it or bottle it up or let it out. Now, I have a place. Green growth. Moist dirt made of manure and garbage and full of creepy crawly things. It is a place of peaceful, vibrant life springing up out of muck. We’ll be OK. We have to pull the weeds, and the weeds will compost into the basis of our fruitfulness. Breathe in the fresh air. Reenter the fray, knowing that we are God’s crop, and He is tending us; the rain, the weeds, the training and pruning, it is all working toward the harvest He is bringing forth. Read the rest at Learning How to Grow on Afterthoughts.